You may wonder why so many photographers wander around with a large and bulky digital SLR hanging around their necks? Perhaps you're more than happy with your compact digital camera - and I'd have to agree that compact cameras just get better and better, practically by the week! 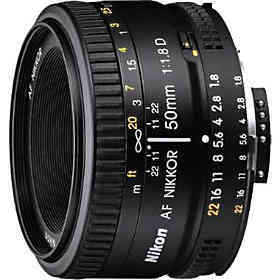 There is something digital SLR camera owners can do though, and that's change lens. I'm sure you're wondering why bother, especially when the zoom lens on your camera does all you want. Well, there is one lens that at first sight is spectacularly pointless - prime lenses. Prime lenses are fixed focal length lenses. Zoom lenses are variable focal length. That means zoom lenses go from wide angle to telephoto. Prime lenses ... well, they don't change at all. They are stuck at whatever length of zoom they had when they left the factory. Why bother I hear you cry? First, because there's no need to fit in a zoom mechanism the quality of the optics tends to be better. Second, the aperture goes much wider in a prime lens. This means you get much better control over depth of field, and that's one thing that can really make your photos stand out from the crowd. There's a third reason that prime lenses are worth having - they make you think more about your composition. And that's something we can all try no matter what camera you own. Here's something to try - set your zoom to something around the middle of its range and don't move it. Instead, move yourself, or reframe your subject. Once you get out of the habit of constantly nudging the zoom control it's amazing how you find yourself really considering the scene you're photographing. And that can only be a good thing for your photography! Learn what the aperture is, and what it does.